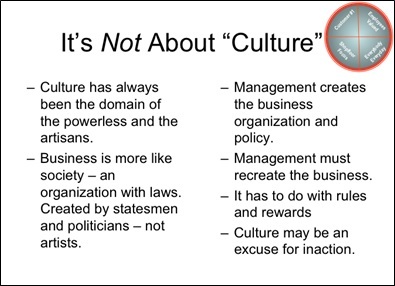 Some time ago, while giving a presentation entitled Organizational Obstacles to Lean, I displayed a slide with the title “It’s Not about Culture”. My point was that ‘culture’ is a bad analogy because it places the burden for change on the shoulders of employees rather than on management where it belongs. My friend persisted that his Lean culture was embedded, so we agreed to disagree. A short time later, my friend’s company was acquired by a competitor. The ‘embedded culture’ disappeared in a few short months. Lean leaders from that company became lean refugees; some were fired, others departed voluntarily. What had taken years to build was unwittingly dismantled by a new management team, who apparently also felt the culture was embedded, and needed no further care and feeding. On the flip side, John Shook, tells a great story about NUMMI, an early collaboration between Toyota and General Motors: In one short year, under a new management team from Toyota, the NUMMI plant – previously the worst GM plant in the US – became General Motor’s best assembly plant. Once again new management apparently triumphed over embedded culture, this time for the better. Was a new embedded culture created? I think not. Management had created an environment that favored continuous improvement. Some persons may feel like I’m mincing words, but I think words direct our thinking and our actions; and buzzwords can cause us to turn a blind eye to real problems. When we define our business problem as “culture”, we may be only fueling a burgeoning market for ‘culture consultants” while avoiding the need for management to change bad systems and management practices. How do you feel about culture? Please chime in. I’d like to hear from you. BTW Beginning in July, I’m going to experiment with a series of forty minute webinars I’ll refer to as “Tuesday Tea Time with The Toast Dude”; same themes as my blog, just a different medium where ideas can be exchanged in real-time. Added bonus: participants will be entered to win a free registration to our Northeast Region Shingo Conference, on September 24th & 25th in Hyannis, Massachusetts. The winner will be announced live at the conclusion of the webinar. I’ll provide more details about our first topic and how to register next week, but for now please “save the date” on your calendar for 3:00 p.m. on Tuesday, July 9. This entry was posted in Old Lean Dude and tagged bruce hamilton, continuous improvement, John Shook, kaizen, Lean Culture, Lean Management, Management Kaizen, toyota production system, TPS on June 21, 2013 by GBMP. Well I do agree with your friend that it IS about culture, but I also agree with you that blame should be deflected to the managers. The key concept to understand is that building and sustaining the culture is – and always will be – the responsibility of management. In fact, you could argue that this is one of their most important and primary responsibilities. 3:00 PM for the webinar, but which time zone? Eastern…sorry for the oversight. Thanks Larry. Really enjoyed your blog. Whether you call it culture or favourable environment, doesn’t really matter as you say.. What it is, is a set of behaviours and practices that the management team is committed to and shows the employees by example every day. So for example if they want a “culture” of continuous improvement what are they doing every single day to demonstrate that. For real leaders like Art Byrne, they are personally running kaizens and coaching and mentoring people on the floor. In my experience most senior managers are too lazy intellectually to do this. You can’t even get them to the gemba half the time. So I believe there is something important to this “culture” thing but it is absolutely the responsibility of management to be responsible for it and drive it home. It does not take that long to change it with the right leadership in place, I have personally been part of it. And as you know a true Respect for People philosophy is key to the “right”culture. After reading your point of view on culture, I would agree that management must provide a “favorable environment” to facilitate change. We consistantly refer to our “culture” as having a safe zone to learn and fail. It works in some plants, and not so well in others. I believe leadership’s commitment to “walk the talk” is where we are most successful. I have to say that I was not expecting to leave comments in protest to your work. I enjoy your blog and of course The Toast Video. I also agree with what I believe is your point of this post in that Leadership is responsible for the changes that are needed for a successful Lean Enterprise Transformation. Yet, it’s all about culture. Since you referenced NUMMI, I am comfortable noting that my company (Incito Consutling Group) has many NUMMI alumni. One of my colleagues was at NUMMI before it was NUMMI (i.e. just GM) and there on the last day. Each of the NUMMI alumni would say it is all about culture. I would agree based on my personal experience. Leadership must create a culture where the people on the production floor can solve problems and help to drive change. Without a true culture change, improvements will die when leadership inevitably moves on. I would even say that the difference between true transformation and typical short term improvements is that the culture is changed. Cultural change does not happen unless the behavior of leadership does not change. Thank you for all of your great work. Culture is not a management excuse – It is management’s job! Culture is the sum of the habits of those in the organization and performance is certainly a result, in large measure, of those habits. It is no excuse, it is the job of management to create a positive, innovative and performance oriented culture. Of course management creates the rewards, structure, strategy, etc. But those things impact the culture. They are the drivers of the culture. I think about 5S’s = Systems, Structure, Skills, Style and Symbols. Culture is driven by each of these – who gets what information, in what form, when – for example, has a large impact on the culture. It is management’s job to design those 5S’s to optimize human performance or the culture. Management can not use culture as an excuse because they are responsible and own that culture. It is not something external (although external realities do impact the culture). I have heard the ‘culture’ excuse being used to either hide an unpleasant truth- ie management don’t want to change ‘their behaviours’ but expect others to do so. Of course, there is a growing ‘consultancy speak’- read other source of non-qualified revenue’ for culture transformation. It’s true that there needs to be an environment where CI or transformation is encouraged, and that people feel comfortable with engaging and improving. However this quickly evaporates when management fail to support/take responsibility when things don’t go according to plan, or support a cost cutting ‘ read headcount reduction’ initiative. At Toyota we were told that ‘culture is a mythical creation, driven from the sum of our behaviours’. Whereas Toyota still have a ‘ no –one will lose their job, as a result of Kaizen’, we see the need to report progress to financial institutions on an ever shortening frequency. Supportive management, should have the culture of ‘gemba walking , respectfully, supporting their people and the long term goals’. If progress isn’t happening as fast as is needed then a quick “5 Why” might reveal a few ‘inconvenient truths’. Thanks for all your observations. I had a feeling I might receive a few for this post. I agree with all of your comments but, as I noted in my post its just he word – the buzzword – that worries me. When I hear managers use the term ‘culture’ as if it were created by employees, it makes me cringe. Same thing with the analogy to “DNA” (originally taken from Bowen/Spear’s excellent article “Decoding the DNA of TPS”) that gets carelessly thrown around: A manager of a large corporation said to me recently, “We’ve got to change our employees’ DNA if we hope to sustain improvement.” It’s not the DNA of the employees, but of the system that needs to change — a responsibility for managers. Analogies like these are intended to illuminate, but in some cases just hide the problems. Now that I have your attention, I hope you’ll all tune in on July 9 for my inaugural Webinar about another popular buzzword: Engagement.